Many years ago, we seldom heard of conditions with the thyroid. It was often a gland that, as long as it did its part, was pretty much left alone and not discussed. However, with modern medicine and all the great technology available to doctors, we’re hearing more about thyroid problems, such as hyperthyroidism, that can cause serious problems if left untreated. Hyperthyroidism, also referred to as overactive thyroid, is a medical condition that occurs when the thyroid produces excess hormone. Symptoms of hyperthyroidism may include weight loss, irritability, hand tremors, overactive reflexes, nervousness, anxiety, warm and moist skin, sleep difficulties, and muscle weakness in the thighs and upper arms. Graves' disease, a thyroid disorder that can cause hyperthyroidism may result in bulging eyes. One of the first things your doctor will do is give you a physical examination. An exam may suggest hyperthyroidism but your doctor will probably order a blood test to measure the amount of thyroxine (T4) and triiodothyronine (T3) and TSH (thyroid-stimulating hormone) in your blood. An indication of hyperthyroidism could be low TSH levels or a high level of thyroxine. In addition, your doctor may choose to get a thyroid scan to get a better view of the gland. For the thyroid scan, you’ll have a radioactive isotope injected either in a vein of your hand or elbow. What kind of medical professionals take part in the diagnosis? Having your hyperthyroidism diagnosed may be done by your family doctor. If your family doctor suspects that your symptoms may be attributed to hyperthyroidism, he or she may order the required blood tests. However, your doctor may also recommend that you see a endocrinologist, which is a thyroid specialist. Patients can find a list of certified endocrinologists through the American Association of Clinical Endocrinologists’ database, and the American Thyroid Association also has an online database listing all the endocrinologists in the U.S. Although endocrinologists aren’t always part of the diagnosis process, they generally are involved in the follow-up treatments and checkups. 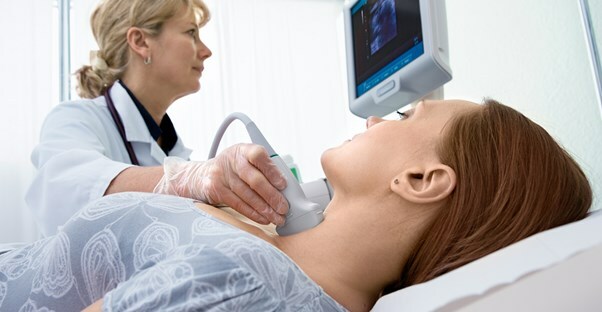 If a thyroid scan is required, this procedure is generally done by a radiologist in the nuclear medicine department of a hospital. What is the treatment for hyperthyroidism? Your doctor or endocrinologist may require a couple of different treatment methods, depending on the severity of your condition and other factors. One of the most common treatments for hyperthyroidism is radioactive iodine, which makes the thyroid shrink and the symptoms decrease. This method is relatively safe and considered to be quite effective, although it may take a few months. Anti-thyroid medications, such as methimazole and propylthiouracil, are also used to treat this condition. These drugs decrease symptoms and stop your thyroid gland from overproducing hormones. Although these two drugs can successfully treat hyperthyroidism, they can also cause serious or fatal liver damage. Beta blockers may also be used for hyperthyroidism; however, they’re used to provide relief from some of the symptoms while the other treatments are working on the actual disease. In some rare cases, patients may be candidates for surgery on the thyroid.